Think of the greatest team sport in the world (Rugby League, naturally). 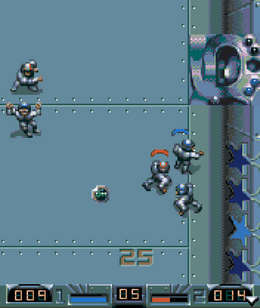 Completely change the rules, and you’ve pretty much got Speedball 2. OK, so I just wanted to get a Rugby League reference in there. To tell the truth, it's closer to Handball... 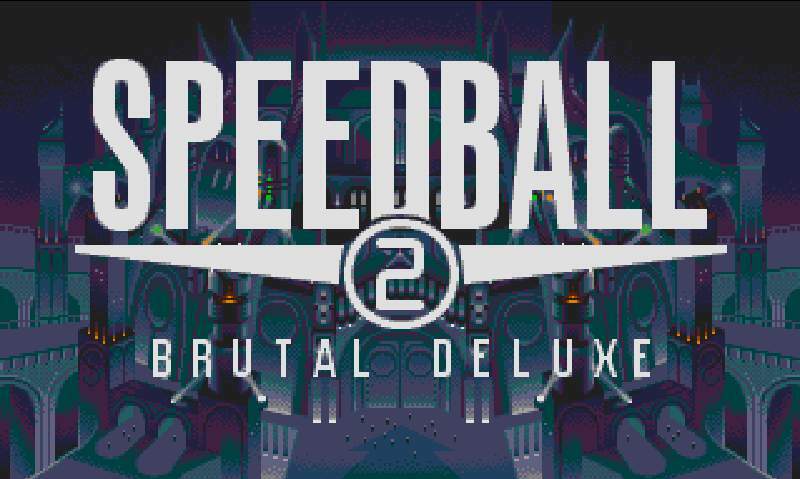 But if Speedball as a sport existed today, it may just about surpass Rugby League as the greatest sporting entertainment you could ever hope to see. 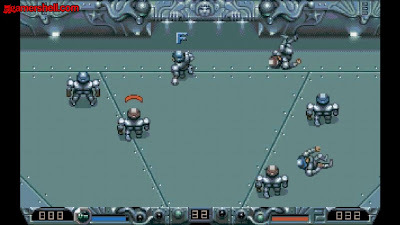 Whilst the first Speedball game descended into relative obscurity, the second game in the series has been widely recognised as one of the all time greats of gaming, and certainly The Bitmap Brothers’ finest moment. 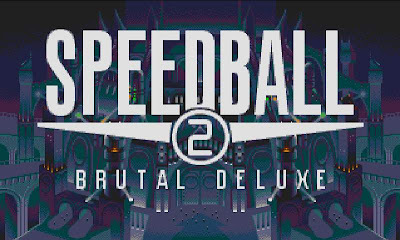 Cutting a fairly short story even shorter, the basic back-story is that the original sport of Speedball was destroyed by greed and corruption, revived as Speedball 2, and onto the scene bursts a new team, Brutal Deluxe. This is where you come in, as their coach and on-field controller. The basic rules of the game are easy enough, there’s no offside or handball or penalties for violent conduct, simply score more points than your opponent. 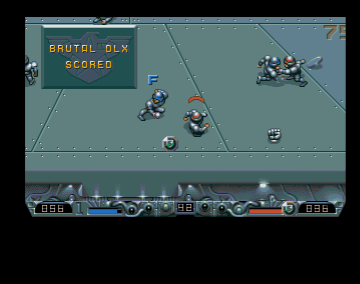 Points are scored either by putting the ball into the opponent’s goal (worth 10 points), injuring an enemy player (also worth 10 points) or hitting certain target areas around the arena (some are worth 2 points, some have other properties). You can throw the ball in any direction, you can punch or slide tackle your opponents, or if you’re fast enough you can run around and try to collect some of the bonus items that appear randomly. Coins boost your funds (there’s a shop/training facility you can use between matches depending on which game mode you play), whilst other pickups boost your player’s abilities or even have a temporary effect on the whole team, or opposition team. For example, there’s a power up that makes your team invincible to tackles for 5 seconds, another knocks all the opposition over, another roots them to the spot for 5 seconds, giving you the opportunity to make some easy yards and hopefully score. Teams consist of 9 players, a goalkeeper and two defenders make up your defence, 3 midfielders sit across your middle line, and 3 forwards for your main attack. The closest player to the ball is automatically selected for your control, which can on occasion be frustrating, but for the most part makes controlling your team a cinch. Between matches you can manage your team, building up their abilities using the money you earn from winning and what you may have collected on the field. Whilst the “buildup” method may result in maximum achievable results, it costs a lot as you have to build up the whole team to increase maximum potential. However, you can buy souped-up players (for a price, of course) to give your team a quick boost. Action on the field is fast and frantic. 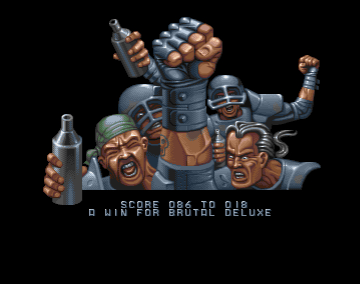 Whilst trying to collect as much money as possible, you still want to win by as many points as you can, and to this end the arena provides a couple of helpful tools for your use. First of all, there’s the multiplier ramp. Located at either side of the arena, all you have to do is through the ball around it, and your score from that point on is boosted by 50%. Do it again, and it’s boosted by 100%! 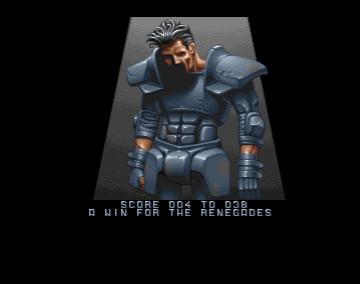 Of course, your opponent can do the same, but first either one of you must reduce any multiplier the other has to zero. Potentially, you can rack up huge scores if you get the multiplier and play against a crap team where you can just keep on scoring! There’s also a “Hot Ball” target. Hit this, and the ball becomes dangerous to the opposition for a little while. As long as you’re not caught in possession, you can hurl the ball toward the opposition goal, and watch as they are knocked over by the deadly ball. However, beware that if you are tackled with the ball in hand, the ball becomes dangerous to you instead! A simple concept, a simple sport, but the playability factor is so high, you just keep coming back for more. You’ll find yourself pushing your skills to the limit to finally beat the likes of Super Nashwan and Lethal Formula, laughing as you brush aside Baroque, injuring their centre forward 3 times in one match, and joining in with the calls of “Ice Cream! Ice Cream!” as the ambulance droids carry his prone body away. Sport doesn’t get much better than this. 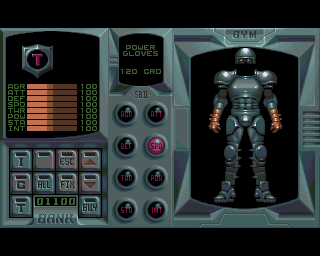 If you have never played this, hunt it out and give it a go. It'll be worth it! 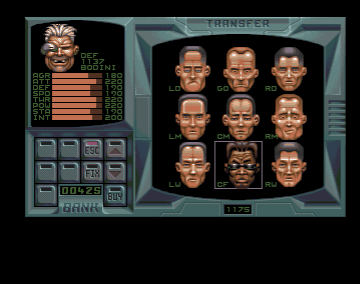 i used to rent this game. i remember it as loads of fun.